Highland Associates has been providing A/E design services for this client under various term contract agreements since 1992. We are a Strategic Alliance Design Partner with this company providing architecture, interior design and MEP/S engineering. 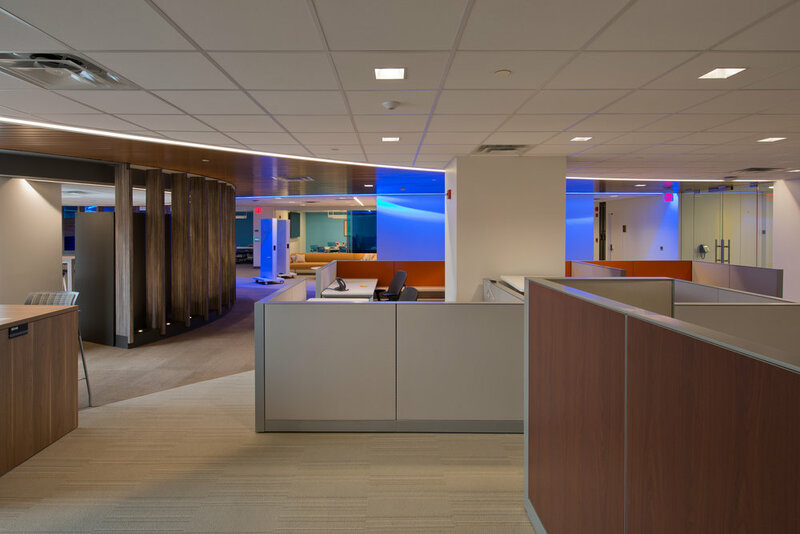 Highland has designed multiple office facilities, call centers and web hosting sites as the selected A/E firm for “On-Call” design services throughout the Mid-Atlantic region. 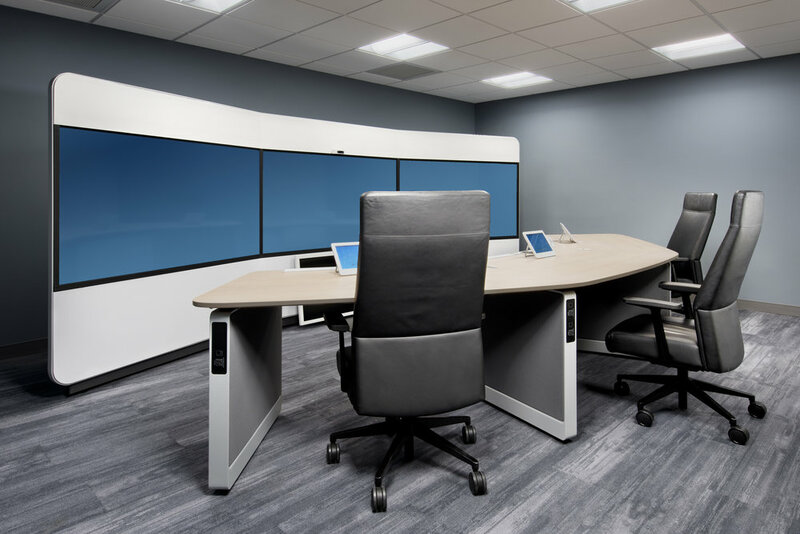 As part of a company consolidation strategy, Highland was engaged to develop a program and implement a restack at their Bedminster, NJ location. This project consisted of a consolidation of 3 off site buildings into an existing 900,000 sq. 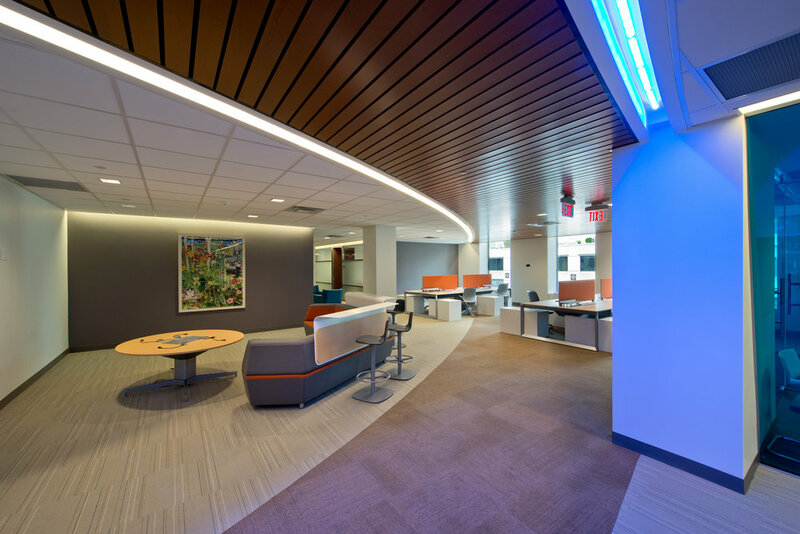 ft. multi-building campus to create a strategic workplace environment. This consolidation allows for 3,500 people to work in the building while supporting a total population of 5,000. 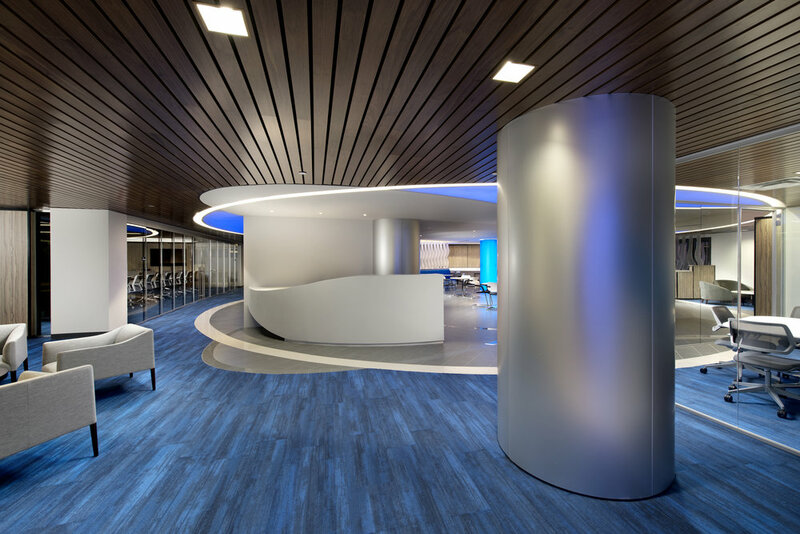 A major aspect of this project was the renovation of the existing cafeteria to include a shared meeting area component while upgrading the space in both aesthetics and infrastructure. 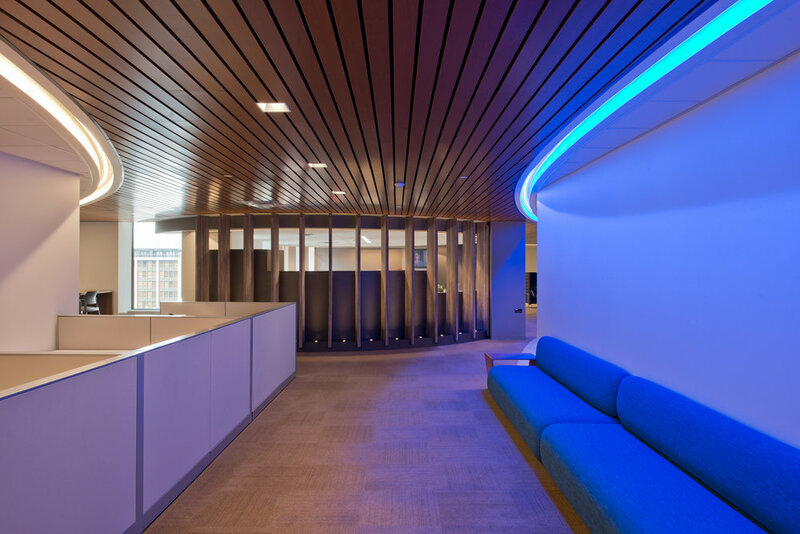 Office areas also received a comprehensive re-working to allow for group requirements to be accommodated. 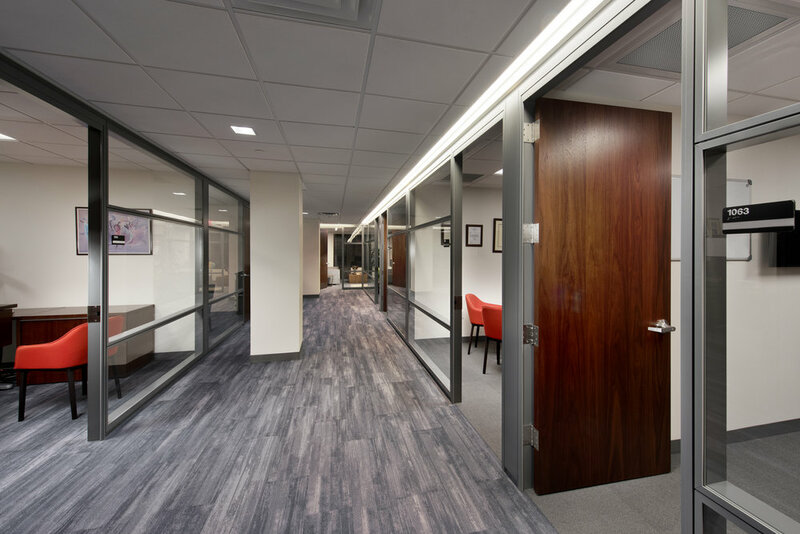 Our team was presented with the opportunity to complete an office renovation on 2 floors for this distinguished international telecommunications company located in the center of Washington, DC. On the 35,000 sq. 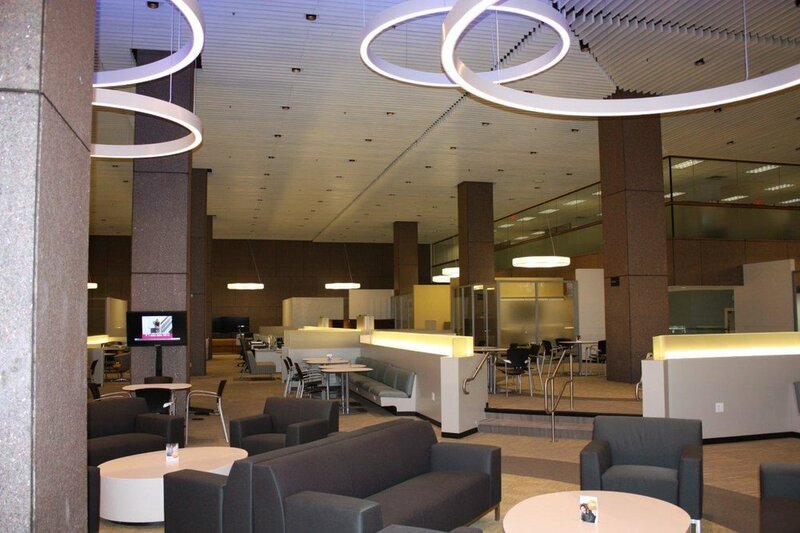 ft. 8th floor, the centralized WorkCafe was designed to combine work and dining space, supporting various work styles. 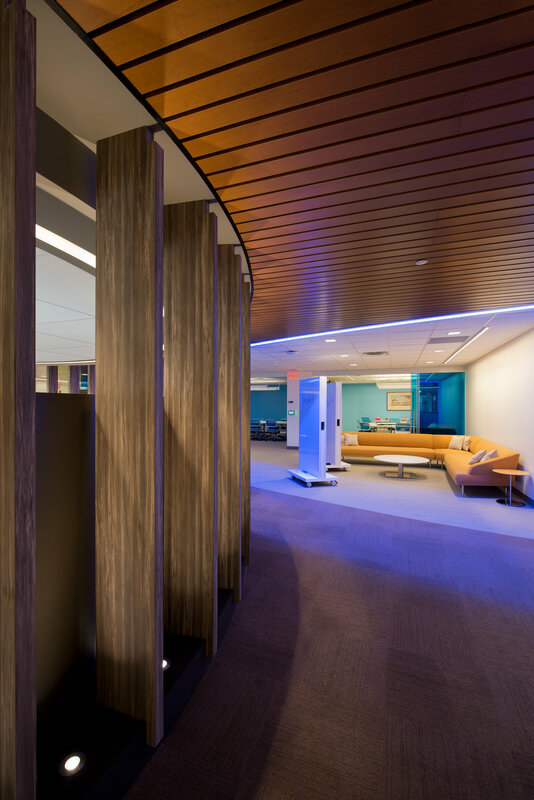 Pleasant exterior views with a variety of seating options including stand-up and sit-down allow for debate, communication, and discussion. The atmosphere of the WorkCafe is relaxing and designed with wooden features creating a peaceful candid experience. 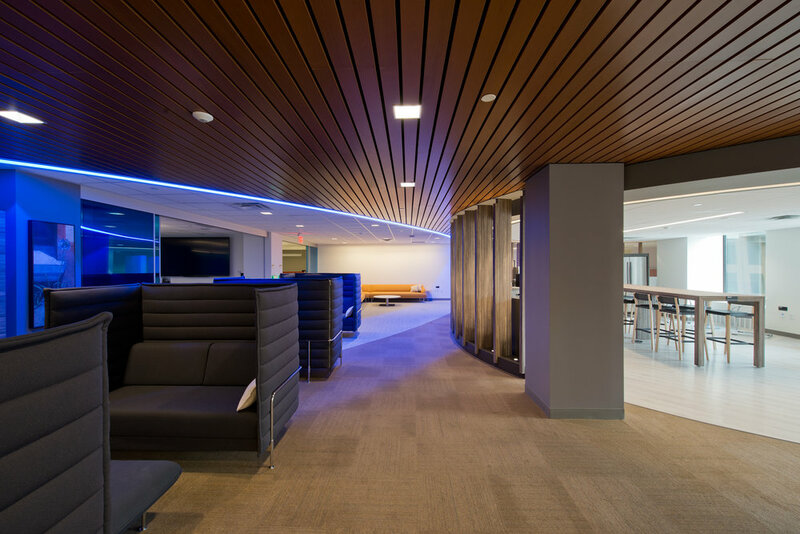 Designed to be a central gathering space, the WorkCafe supports what employees desire to utilize – complete work, discuss with colleagues and provides an open space for teamwork and group meetings. 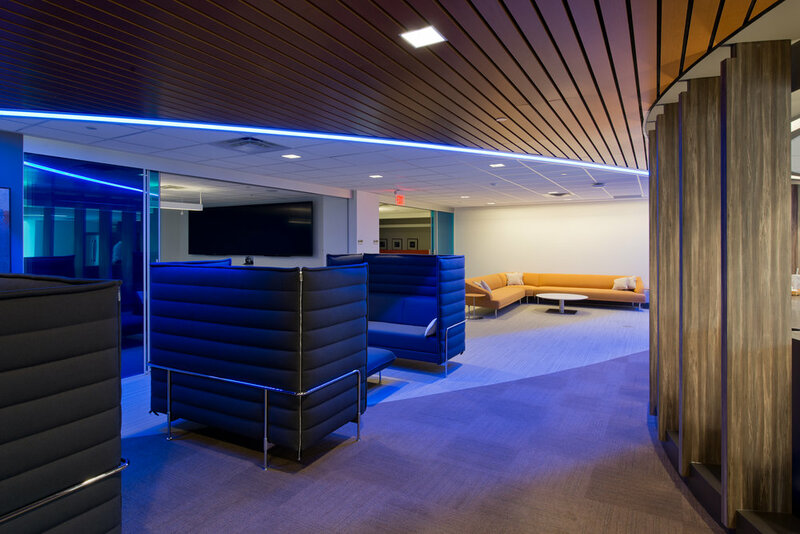 Centralized lounge spaces encourage users to share values, beliefs, needs and interests of the company. On the 35,000 sq. 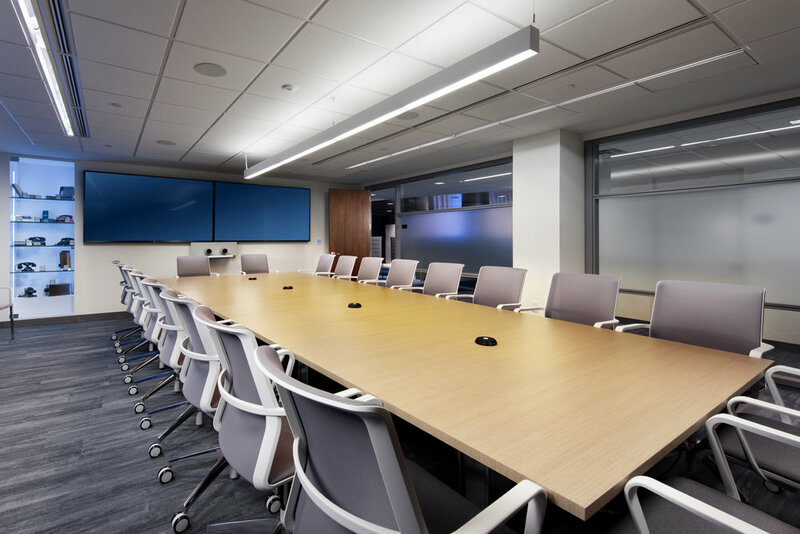 ft. 10th floor, collaboration spaces were designed to allow informal discussions as well as open conference areas for more formal meetings. The pantry is adjacent to the town hall room to allow for a break out space after meetings. 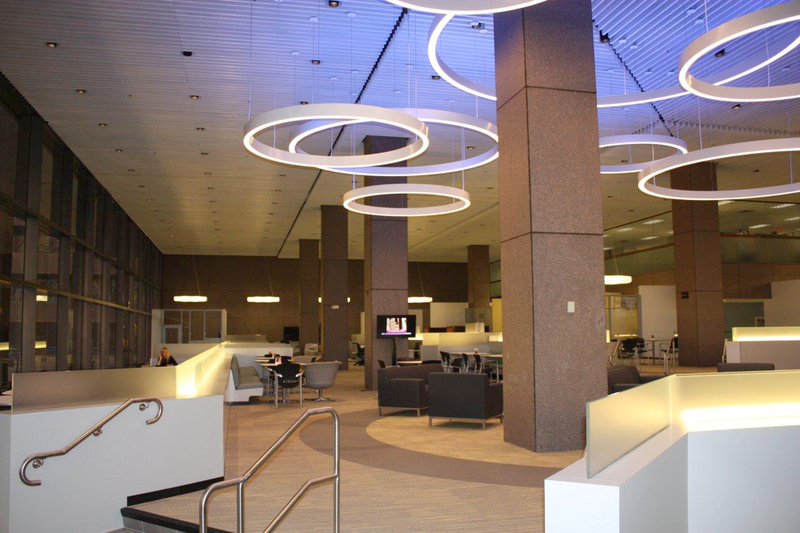 The town hall space has reconfigurable furniture to allow for multiple functions. 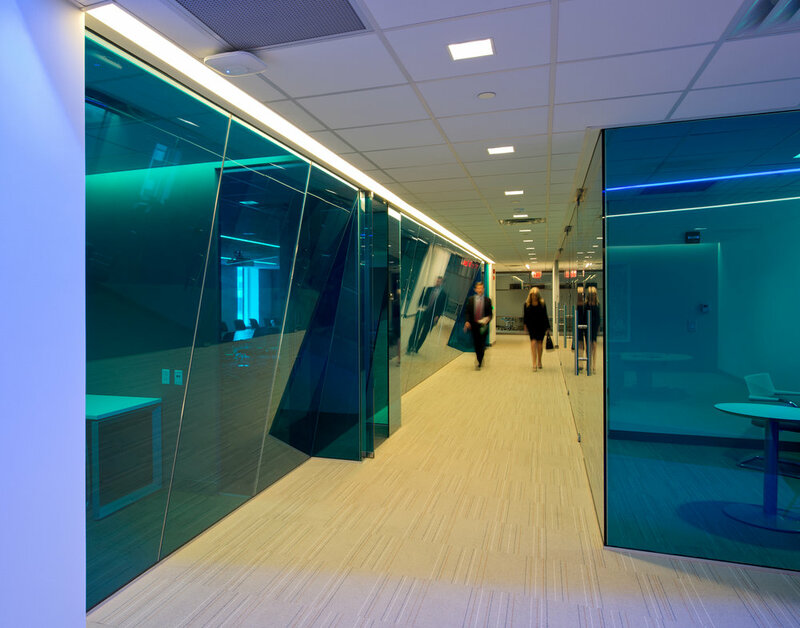 It also has a retracting wall to create larger and smaller areas. 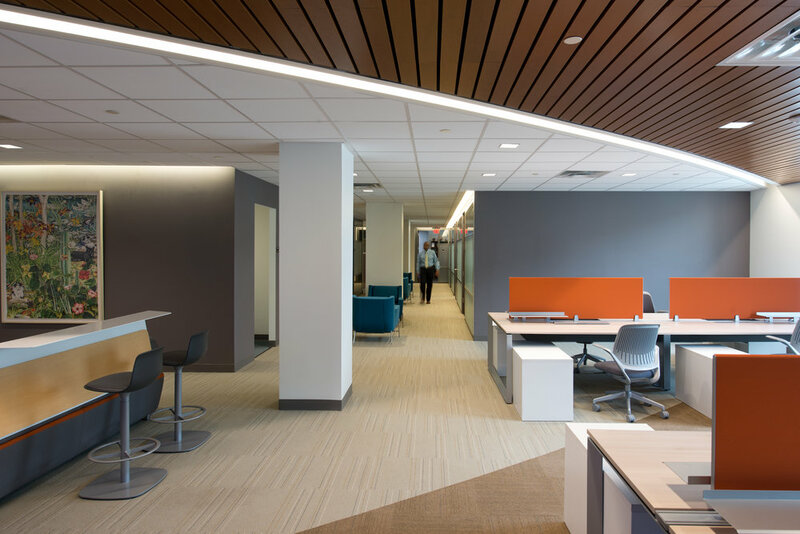 The offices on this floor are within the company's standard space allotment and each office has height adjustable sit/stand desks.